“In 1955/56 there was a man with an 8 mm movie camera at quite a number of the 6-man football games. It would be a miracle if any of these old movies still survive but I was just wondering. Someone told me that they thought that the man was Mr. Rube Wilson and that he lived in Cliffside. Since you and your network of contacts are the source of all info related to Cliffside, I just thought that I would ask if anyone remembers these movies, or if perhaps someone has some of these old films. “I am having fun with your most recent update—what the heck is a ‘four-man bus window hanging’ competition? How was it scored? How in the world could Cliffside beat Tri-High by 13 to 5? I doubt the entire story. “I have been interested in exactly what happened in Rutherford County during the Labor Day 1934 ‘General Strike.’ I actually went to the Isothermal Library and made copies of the Forest City Courier articles from Thursday Sept. 6, 1934, Thursday Sept. 13, 1934, and Thursday Sept. 20, 1934. The newspaper does not tell a lot. I have no idea if this is because the ‘mill owners’ controlled the news media at that time or not. Actually in the 9/6/34 issue actually had about the same length article about ‘the coming opening of the Colfax Free Fair’ as it had about the strike activities. “Thank you again, Reno. I look forward to the update every month. Yes, it is that time of year again, the happiest season of all. At this time of year, my mind always goes back to the 1950’s and very early 60’s when I was growing up in Cliffside, on River Street and Pine Street. “I, like all people from Cliffside and around the world, probably think back to Christmases long, long ago when we were kids and and looking forward to Christmas morning, waking up long before our parents, looking at the Christmas tree with presents underneath and wondering what treasures were there. Like most families in Cliffside, we didn’t have much (most ordinary mill workers didn’t), but we really enjoyed and treasured what we did have, especially our families and friends and our loving community that was Cliffside. My eyes never fail to tear up when I remember those days. My mind conjures up Christmas trees with bubble lights, Daisy BB rifles, gun and holster sets, icicles hanging from the roof outside, Christmas dinner and playing with all the neighbor kids, sharing our presents. For my brothers and me, it was usually the kids of T.J. McDaniel who lived in the apartment building on River Street. “Now, I look forward to our children, and sometimes other relatives, coming to our home from Las Vegas to visit and spending Christmas with them. It is a great feeling watching them open presents and enjoying Christmas, even though they aren’t kids anymore. Our priorities surely change as we get older. But the joy of Christmas never gets old. Finally, we should never forget the real meaning of Christmas, the birthday of our lord and saviour, Jesus Christ. Along those lines, I also remember being involved in our annual Christmas play at Mt. Pleasant Baptist Church and our beloved minister, Jim Bishop. “I am a decendant of Jesse Lee Frye and Valoree Selena Sarratt. I was looking at your information on the Sarratt family and you do not have a complete listing of Jesse and Valoree’s children. They had seven children: five girls and two boys. The girls were Phyrnia Frye Moore, Margie Frye Price, Viola Frye Humphries, Carrie Frye Simpson and Lois Frye Moore. The boys were Samuel and Joe. “Margie, Carrie, and Viola lived in Cliffside until their deaths. Lois is still alive and living in Ellenboro and Phyrnia, who was my grandmother and the eldest of Jesse and Valoree’s children, lived in Mooresboro until her death in the late 1990’s. I hope this information will help you. If you need additional information please fill free to contact me. 1) What is the name of the river and was the dam used for power generation? 2) It was a Cone plant? and is it now closed? 3) The nearby town of Caroleen – on same river? Power generation? Now closed? “Here is a listing of the Overseers at the Haynes plant while Mr. Beard was superintendent during WW2. “I was doing an internet search for my cousin on one of our ancestors, Amos Owens, and found your article. He is indeed the man in Wall’s Cemetery. He was my great-great-great grandpa and was indeed a moonshiner, and, in the words of my grandpa, “the parties on Cherry Mountain were something to behold.” He was in the Civil War, too. “You have done a wonderful job with this website! I want to mention to you that my mother, a native of Cliffside, passed away on June 3rd. She is Jerleen Gosey West. She had battled cancer for the past four years. “As I was looking at your site today, I thought of all the things she told me about Cliffside. One thing that sticks in my mind is how “no one ever bad came from Cliffside.” It’s nice to remember such great things not only about her but how she felt about her hometown. “My name is Steve Harrill. I grew up in Rutherford Co. and graduated from Chase High in 1971. I presently live I Salisbury, NC and teach music at Pfeiffer University. I have visited your website many times and enjoy it very much. I am descended from a long line of Harrill’s. William H. Harrill, better known as “Talking Billy,” was my Great, Great, grandfather and sold the land to Henrietta Mills to build the Caroleen Plant. “I have extensive documentation from around 1865 of many transactions in which members of my family were involved, including two documents from S.B. Tanner which I have attached as well as some old family pictures. Please feel free to use them on your site. “Your efforts are certainly to be commended. “I attempted to compare the maps with present day maps. Much of the area is can be recognized but it’s sad in a way to see that probably a majority of the houses are gone. I was thinking how this certainly could have been made into a movie. “My wife and I travel a lot in a motor home and in doing so, I enjoy picking up local newspapers and reading about people that I don’t even know! A local newspaper gives to some extent a barometer reading of the neighborhood, whether we’re in TN or PA or wherever! People are amazing to me, especially in view of the fact that God has NEVER created two alike! “I am a descendant of Jesse Lee Frye and Valoree Selena Sarratt. I was looking at your information on the Sarratt family and you do not have a complete listing of Jesse and Valoree’s children. They had seven children 5 girls and 2 boys. They were Phyrnia Frye Moore, Margie Frye Price, Viola Frye Humphries, Carrie Frye Simpson, Samual Frye. Lois Frye Moore, and Joe Frye. “Margie, Carrie, and Viola lived in Cliffside until their deaths. Lois is still alive and living in Ellenboro and Phyrnia, who was my grandmother and the eldest of Jesse and Valoree’s children lived in Mooresboro until her death in the late 1990’s. “My mother was born and raised in Cliffside. She is the sister of Ginny Anne Reid. “In 1962, the summer I was born, my mother hit a child on a bicycle. It was very serious. Aunt Ginny Ann said it actually happened in the Fairview community near the Goodes Grove Baptist Church. Would you have happened to see anything on this during your research for this website? “I know the young boy did recover after time in Charlotte hospital. Someone told my mother he grew up to be a teacher. (I think his name was Curt Simmons) She was also told he had walked with a limp as a result of the accident. My mother never forgot that boy and when we would come across a child on a bicycle even 35 years later she would get really upset and have to pull the car over. “I’m a grand-daughter of George W Hill and Annie Sue Dedmond Hill. My parents are George O. Stacey and Emily Faye Hill Stacey. Mother died in 2003. My sister, Marie, and I have a bunch of old pictures that we’d like to share. I have most of them scanned in and can send them by email, or, I can make a CD and send that. I also have the whole collection of the Super 8 movies that my aunt, Margie Bostic, made during the 50’s and 60’s. Currently, they’re in VHS format, but I’d planned to have them converted to CD. Now’s a good time to do that. The films are all of the Hill family. “I’m tellin’ you …. finding your website has really meant a lot to me. I’m 54 years old, but the memories of Cliffside, and my grandparents’ house on Dedmond Road, are as fresh as though it was just yesterday. “Thanks for publishing the photo of the service station half-way up Harrill Town Hill. This was the building that when most of us can remember became the Lutz-Yelton Oil Company building – and the Crown Service Station was built next door (Larry Quinn ran that station until a few years ago – it is ‘abandoned’.) I knew Christo Deal really well – he sang in the Caroleen Baptist Church choir with me for a number of years. Also I knew C. B. and Roy Smith. Also Jake Price – and all his daughters. “It is interesting that the gasoline pumps in front of the service station are ‘mixed’. That is, two of these are the old ‘manual’ type gasoline pumps and one is the ‘modern’ electric pump type. The old ‘manual’ pumps had a long handle which you used to pump the gasoline up into the clear glass bowl on top of the pump – you ‘sort of’ guess how many gallons you had in the bowl by the markings on the side of the bowl and then you let the gasoline drain down into your car’s gas tank by gravity (sort of interesting since we now insist on gasoline measured digitally to the .00 gallons – shows what $3 a gallon leads to). “Interesting also that you mention ‘Windy’s Grill’ across the highway from the Lutz-Yelton Oil Company building. In the 40’s Windy’s was not there. Windy started out his ‘hot dog stand’ in the 40s in a little building right across the street from Lowe’s Furniture Store – down at the bottom of Harrill Town Hill. This little building could not have been much larger than 15′ X 30′ and its original use was storage for the furniture store. Windy sort of ‘refurbished’ this little building, put in a grill, had a counter and about 7 or 8 counter stools, and began selling hot dogs. His hot dogs were excellent, chilli was great, and he began building his business – a lot of it on my quick trips across the highway from the front door of Lowe’s Furniture Store to ‘get a hot dog and an RC’. It must have been about 1950 before Windy built the brick building half-way up Harrill Town Hill on the ‘flat’ area. “I am new to the area (Mooresboro) and I am living on Circle J Farm, Cliffside Rd. “Here’s my question: I’m trying to find out about the OLD Mount Pleasant Church & School Road. The remnants of the old stone wall & dirt road run across the farm. I have looked everywhere to no avail for info on this. “I grew up in Gaston County near Mt. Holly, and your expressions brought back some great memories. I wanted to offer a few for your collection. “I just wanted to drop you a note to thank you for this website. I found it when doing web searches using my family members names. I never dreamed that i would find so much information about my own family. “So far, I’ve seen pictures of my aunt and uncle (Horton and Jerene Landreth), my grandfather (Marchel Bailey), and my great grandfather, Arthur Allen. “Also, the historical pictures of Cliffside are amazing. I’m 30 now and i can still remember some of the buildings in the pictures from my childhood visits to Cliffside. Sadly, many of those places no longer exist. That’s why i think that your website is so important. “Thank you so much for all you do. “I was doing an internet search for my cousin on one of our ancestors, Amos Owens, and found your article. He is indeed the man in the Wall’s Cemetery. He was my great-great-great grandpa and was indeed a moonshiner and in the words of my grandpa ‘the parties on Cherry Mountain were something to behold.’ He was in the Civil War, too. “Sally Tate is my great aunt, my grandmother’s sister. She is buried in my grandmother’s lot at Cliffside Cemetery. My grandmother is Jenny Bailey, married to John H. Bailey. Sally is buried with her sister Jenny, brother Robert Morris, brother-on-law John, and Vernon Bailey (infant son of John and Jenny). “My name is Charles Nodine, Jr. I work for Duke Power Company. I once did some training at the Cliffside plant back in 1980. “My parents are Charles and Lib Nodine. They live over on Ramsey Rd. off Mt. Pleasant Ch Rd. Dad was the maintenance supervisor at Cone starting about 1980. He could answer many questions you might have about the mill since then. “Dad was in the Navy when I was very young. Mom and I lived with Papa and MaMa over on Mt. Pleasant Church Rd. It was a dirt road then. “One of my earliest childhood memories is Mom and my Aunt Betty taking me to the drugstore in Cliffside to get a Sundrop. I luuuuvved Sundrop. I was probably 4 or 5 years old (about 1964-65). Seems like the movie theater was still there too. They were just girls and were known to drive a little fast down Cliffside highway, once meeting a truck on a narrow bridge and shaving the door handles off of a Plymouth. “My Uncle Junior McBee lived in one of the mill houses over on the river on Cliffside highway. I remember playing with my cousins UNDER the house because it was elevated off the ground on river stone foundation pillars. The house had electricity, but I don’t remember wall outlets, just overhead lights that had string switches. One of the sockets had a screw-in outlet. They didn’t have telephone. Junior worked at Cone all of his life. He lives in Henrietta now. “Your article in the latest CHS Newsletter concerning dogs in Cliffside brings back a memory of about 1934. “Around age 8 we were living on Hazelhurst Farm west of Cliffside, near Ferry, where I had one or two dogs that I loved very much. On moving to Cliffside at age 9 or so, since I couldn’t have a dog, daddy bought me a goat (with or without Uncle Charlie’s permission ?). “We kept it staked in the back yard, and I was told not to take it out of the yard. However, one day I took it without permission, rope around neck, down Main Street toward town. Somewhere before I got to the Memorial Building it jerked the rope out of my hand and ran in front of a car and was killed. “I am Curtis Smith, great grandson of Eli Wilkins. I Thank you for posting the pictures. He worked on Engine 110 for many years. He loved his job and the people he worked with. He passed on Aug 31, 1989. “My grandfather and Raleigh Haynes were visionaries as the town of Cliffside can attest, surviving 100 years until progress caught up with it. My grandfather was building a home for Dr. Lovelace in Forest City when he was killed by a drunk driver on his way home from Forest City. There may not be anyone left who would remember this era, but then, that is the purpose of this web site, huh? 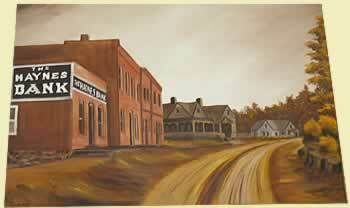 My aunt was Virginia Moore (Miss Virginia) and was a fixture at the Dry Goods Store as it was called then. One of my uncles was Robert (Tubby) Hawkins, another was Hickey Wortman (I notice that his son,Danny, is listed), These are just a few of the faces and names that have resurfaced. “Your ‘Remember Cliffside’ is a most delightful site! I have enjoyed it, having stumbled on it while surfing the web for information on the Golden Age of Radio (of all things!). “While I am an import to the Rutherford County area, Cliffside was firmly planted in my memory as a child. I grew up in South Carolina, near Blacksburg, at the foot of old Whitaker Mountain. In the afternoons, we would go up to the top of “the big field” where we could see the western sky. As the sun was setting, we’d see a column of smoke (this was in the 1940s) rising above the horizon. That was the old Cliffside Steam Plant. We knew little else about this delightful place, but that was enough to spark curiosity. “The website is ‘looking good’ — although it is really getting big and I spend way too much time trying to read it all. “I was wondering – since you have access to so many old photos – if you have ever run across a photo of an old woodsaw truck. You know – the truck that they brought to your house when your Dad bought a load of slabs to cut the slabs into short pieces that fit into the fire place or the woodstove. I have looked all over for such a photo and I have not found one. I know that some of the potters down around Seagrove still use slabs to fire their kilns – and maybe a lot more will be doing so now because of the high cost of propane. A fellow down there had a woodsaw truck up until about 10 years ago. He used a wood boiler located in an outbuilding to provide heat for his house. The fellow died and his son disassembled the woodsaw and sold the truck. “I live in California and did not get to attend Cliffside Day 2005 or 2006. I usually get back home during the summer after my son gets out of school for the summer. Perhaps Cliffside Day could be moved to the summer. I enjoyed the gallery of photos from 2005. Marilyn Moore Kerr and I were elected king and queen for the Halloween celebration at Cliffside school in 1953-third grade. That was the only year Marilyn attended Cliffside school. Marilyn and I exchange e-mails occasionally. She was my third grade sweetheart. You may remember that the Halloween celebration was held in the school gym and auditorium. There were many game booths in the gym. In the auditorium, there were events like the cakewalk and the crowning of the king and queen. I would love to see a photo of that. “Often when I read the articles on ‘Remember Cliffside,’ I shed a tear or two. I never realized how fortunate I was to have grown up in such a unique town. I have more fond memories than I can count. “Especially this time I did cry to learn of the death of Ruth Camp. She and I were such good friends, and I had no idea that she had passed. As children we played together. Her mother, Mamie was so faithful to my grandmother, even after her boarding house closed. And although Ruth worked, she also was very close to me. I loved her so, and every time I have returned (usually for a funeral of a family member) she has come to see me and we just have reminisced, and had a wonderful time together. I do cherish her memoirs and her picture. “Do you have any photos of the Jackson family? My grandpa, Fletcher Andrew, wife Gussie Bridges Jackson, worked in the mill at Cliffside several times. He worked as a share cropper in the summer and went to the mill in the fall. His brothers were Bynum, Gus and Roy. Gus was a supervisor at the Florence Plant, and dropped dead as he was leaving the plant. “That was the first year that the car had a sloped trunk very similar to the shape of the hood and everyone said you couldn’t tell if they were going or coming. “I worked as an electrician at the old mill for about 13 years from 1990 until 2003 when I was laid off. I’ve never experienced anything else like it. That old building had to be one of the most unique places on earth. As an electrician I had the privilege of working on electrical equipment that ranged from early 1900’s up to the cutting edge equipment the mill used at the time it shut down. But one of the fondest memories I have of the mill was the old Power House or Generator Room as us shop guys referred to it. Many times on the night shift I had to adjust the old generators to keep the lights on in the mill—especially after a lightening storm had knocked the power off. That generator room could be a scary place when the water started sloshing through as the pond got low. But I still think it was a marvel and a pleasure to have been able to have learned how to control those big units. “If I get real inspired I’ll try to put something together about my time at Cliffside. I’m not much of a writer though. If you could get some of those old shop boys like Lefty Brooks, Joe Thrift or Eddie Hill who were in the shop for 20 or 30 years to talk to you, they can tell some real stories. “Just wanted to send you a note about your web site. I have really enjoyed looking at the old pictures and reading the articles. I have always lived in Harris and have been told many times about all the houses and stores that were in Cliffside. All of that stuff was going when I was born in ’73. “It was also very interesting about the insert you put in about a small history of Henrietta and Caroleen. In the past few years I have read a lot of stuff on the history of Rutherford County. But Remember Cliffside is one of the best web sites I have seen. Someone should do one like it on Forest City. “I have read just about everything and looked at every picture on your web site. I even went to Hicks Grove Church to see Eva Haynes grave site after reading the story on here. It was like history coming alive. “I could only find one place where Harris Station was mentioned and that was when they brought R.R. Haynes from Florida after his death by way of the railroad. I would love to see some pictures of Harris, the train depot, the stores, cotton gin, etc.. Someone has to have them somewhere. I have seen a few pictures of the old Harris school and, being as big a school that it was, some one should have some old pictures or articles of Harris. I even heard of stories where the Spicer brothers switched the train to the kick off spur and derailed the train..
Good suggestion. On November 30, we’re inaugurating a new “room” on Remember Cliffside called “The County” in which we’ll post all the history we can find (or you can provide) about Rutherford County and every city, town and hamlet within it. “Congratulations on your excellent historical society website. I just happened to find you on the publication date of your new book, Cliffside: Portrait of a Carolina Mill Town. I will refer this site to our own local historical society here in Vista, California (a suburb of San Diego). Yes, we really do have history buffs in Southern California, though some of us can only go back to the winter of 1948. “I am Buzz Biggerstaff’s sister-in-law. His wife, Beth, is my sister. I have gone to the Remember Cliffside website several times to see pictures that Buzz told me about. The one I loved the most was the aerial view of Duke Village in 1952. I had it blown up and it hangs in my office. I just recently started really reading a lot of the things on the website. I just want to congratulate you for all the work you have put into this endeavor. I have had so much fun the last couple of days, learning about the history of my home town. I especially enjoyed the memories by Mrs. Cargill and Mike Fisher. Good point. We’ll try harder to acquire more information and photos of the Duke Power plant and village and include them on the site. “My Dad worked at the mill for at least 27 years and died while still employed there back in 1979. He and my Mom also lived in one of the mill houses. I personally remember the early morning that my Mom would drop me off at the gate house for me to wait for my Dad to get off third Shift. And I remember the day they took the wrecking ball and tore down the auditorium. My Dad would take me to the park over there sometimes to play and to watch the little league baseball team (the Dodgers) practice. Winkie Pearson was the coach, if I remember correctly. “My cousin, George Norville of Shelby, brought your site to my attention. I will be forever grateful to him. Since George told me of the site, my community service, chores around the house and what’s left of my love life have fallen into a state of limbo while I surfed the Remember Cliffside site. I can’t express how much I have enjoyed the opportunity to do a cyber visit with old friends, or at least their pictures and my memories. “Thank you. Without your web site the attached photo, and a very enjoyable day, would not have been possible. “On Thursday, a group of us got together in New Hope, Pennsylvania, to resurrect the Cliffside Railroad for a day. No. 40 looked just as she did in the 1940s and 1950s, and put on a fine show. The photo galleries on your web site were a big help in getting the lettering and striping right. What’s going on here? Back in 1962 Cliffside stopped using steam engines and sold engine #40 to the New Hope and Ivyland Railroad in New Hope, Penn. A railroad enthusiasts group recently redecorated the engine and tender as it looked in Cliffside. We’ll add more information and photos as they become available. “This is regarding the Big Parade, Photo of the Month, September 2003. “I am Blanton McBrayer’s daughter-in-law. I am not sure if you are aware that Blanton passed away August 12, 2004, at the McBrayer Furniture Store. Our family has lost its center and the town of Forest City and its citizens have lost a great friend, storyteller and historian. “I was not aware of your web site, but for some reason I was compelled to Google the name ‘Blanton McBrayer’ this morning. “When I saw the words ‘Big Parade’ and ‘Blanton wrote to me,’ I knew it was him and the picture that was found at my daughter Keely’s house on Arlington Street in Forest City. “Blanton was thrilled when the picture was brought to him and he thought right away it was Cliffside, where his father R. B. was born. “He could not wait to get it to the McBrayer Furniture Store, where he could show the picture off and find out more about it. “Blanton was a meticulous person, therefore on his behalf, I hope you will make the following corrections. I think this was ‘lost in translation’ from the letter, as I am positive that Blanton did not put it this way. “His granddaughter is Keely, not Kelly. His son is called Macky, not Mac. His grandfather’s name was spelled Reuben, not Rubin and Blanton and Eddie’s kids are not running the furniture store. At the time of his death, he and Eddie were the co-owners of the store and Eddie opened the store back up on Monday morning , I am sure with heavy heart, but to an endless parade of people stopping by the store to reminisce about their friend, Blanton McBrayer.